Vallicelli 65 2003 build year. •	Hull is constructed in GRP sandwich with glass/vinylester laminate over airex foam core. •	Kevlar is used to reinforce the outer skin against impact. •	Airex/GRP sandwich deck with micro balloon non-slip finish in white. •	Cockpit sole and seating in teak. •	Complete review of the lazarette area and repaint of all soles (2018). •	Hull sanded and antifouled with 2 coats of antifouling paint (2018). •	Hi-tensile stainless keel strut with cast lead bulb. •	Keel bolts cleaned and bilge at the base of the mast repainted. Lazerette cleaned and repainted (2018). •	1 x Volvo Penta TAMD 31S 105hp diesel engine with hydraulic gearbox (c. 2,500 hours at October 2017, full winter overhaul 2017). •	The main engine has been maintained in accordance with the manufacturers' recommendations. •	New turbo charger on the main engine (2018). •	Cable/quadrant controlled by 1.4m diameter stainless steel wheel covered in white elkhide. •	Hydraulic autopilot with ram connected directly to quadrant. •	Steering system by Solimar, Italy. 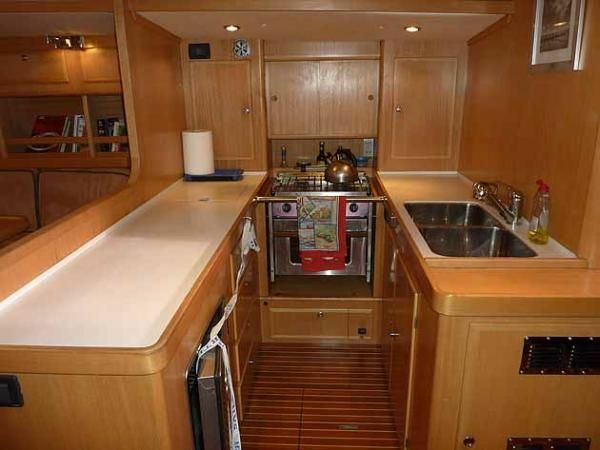 Boatmatch Tip: Want more advice about buying this VR Yachts Vallicelli 65? Checkout our Boatmatch Buyers Guide! •	12v DC system for general service and consumption. •	12 and 220v outlets in Forward Cabin (Owner’s). •	Full rewire of all the ships systems, including replacements of all alternators, batteries and chargers (2018). •	12v 770Ah for general service batteries (2018); rewired connections. •	12v 300Ah for engine starting (September 2016). •	12v 100Ah for generator starting. •	100 Amp battery charger for service batteries. •	50 Amp battery charger for engine batteries. •	150 Amp service alternator on main engine. •	50 Amp starting battery alternator on main engine. •	120amp domestic alternator (2018). •	4kW Fischer Panda generator (2018). •	50 Amp shore power system. •	Raymarine Navi instruments for wind, depth and heading. 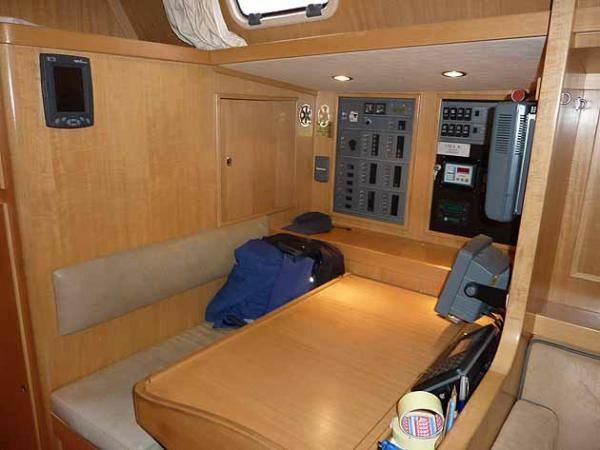 •	Raymarine GPS/plotter and radar with MARPA RL70C at nav station. •	Raymarine autopilot with hydraulic drive and internal gyro compass. •	Leica 420 GPS navigation system. •	Icom VHF with DSC controller DS-100. •	Simrad VHF handheld TC 50. 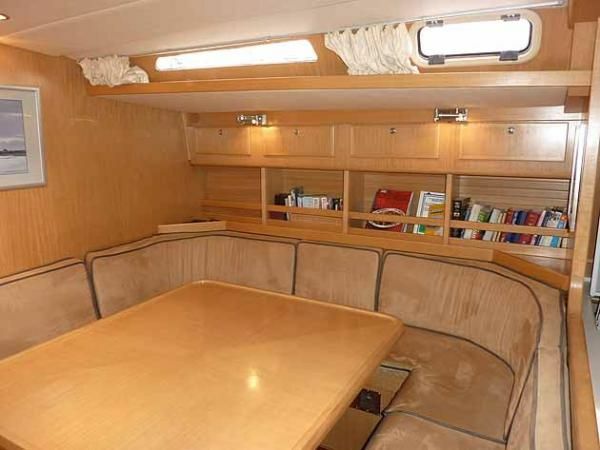 Boatmatch Tip: Need advice about possibly insuring this VR Yachts Vallicelli 65? Checkout our Boatmatch Insurance Guide! •	Variable speed fresh water pump system. •	Manual freshwater pumps as back up. •	12v Spectra Newport 400 watermaker. •	Full overhaul of the watermaker (2018). •	Twin stainless steel sinks with spray taps. •	Force Ten 4-burner gas stove. •	1 x Electric W/C. •	3 x Showers with automatic grey water pump. •	Twin air extractors to remove hot air from cabins. •	Natural ventilation through hatches and portholes. •	CD player and AM/FM radio with speakers in saloon and cockpit. •	2.5m Passarelle in aluminium. •	2.3m Passarelle in carbon fibre. •	Side boarding ladder in carbon fibre. •	55lb Spade anchor; hot dipped/re-galvanised (2018). •	New 100m of 10mm hot dipped chain (2018). •	1000w Quick anchor windlass (2018). •	Spare spade anchor with 15m chain and nylon Rhode. •	Yellow horseshoe life ring with light. •	8 x Inflatable life jackets. •	Total capacity of 800 litres. •	Total black water capacity of 500 litres with macerator pump and deck pump out. •	New stainless steel black tank fabricated and fitted (2018).
. Contact the seller of this VR Yachts Vallicelli 65 for more details. •	Three spreader Velscaf aluminium mast with discontinuous rod rigging and conventional boom. •	Fredricksen deck hardware; luff cars, oversized for full batten mainsail. •	Navtec manual hydraulics operating backstay and vang. •	Stainless steel control panel for hydraulics in cockpit. •	Spectra halyards for main, genoa and code zero. •	Polyester halyard for spinnaker. •	Spinlock clutches and jammers. •	2 x Primary 66.2 self-tailing electric winches. •	2 x Secondary 53.2 self-tailing electric winches. •	2 x Halyard 46.2 self-tailing electric winches. •	Spectra Mainsail, 2010, Elvstrom - Full batten, Fredricksen luff track hardware. •	105% Furling Headsail, 2008, Doyle – Spectra. •	105% Furling Headsail, 2003, Ullman - Mylar/Kevlar. •	Code Zero, 2003, Ullman - Kevlar, manual furler. •	Spinnaker, 2003, Ullman - All ropes, pole and hardware included. •	Service of sails, with new UV trips, in 2018. •	Interior finished in European oak. •	Saloon upholstery in beige alcantara. •	Teak and holly sole board. •	Two pipe cots with rails for attaching ropes, fenders etc. 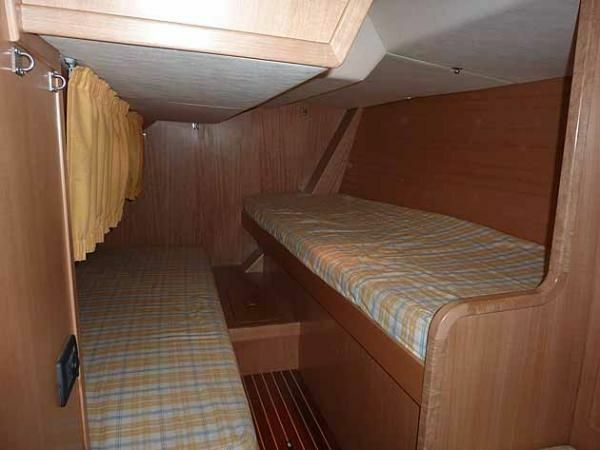 •	Centerline large double berth with V-spring interior mattress. 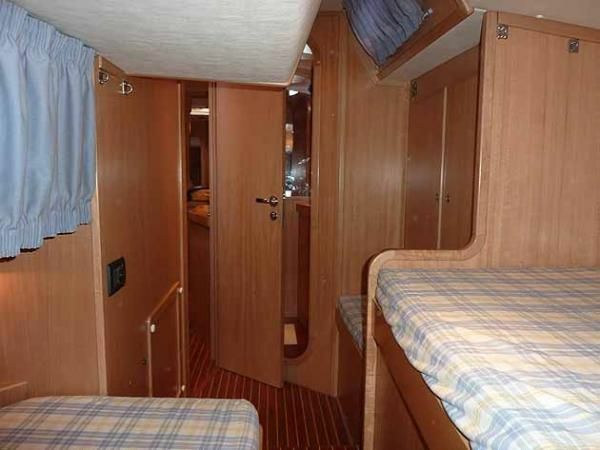 •	2 x Separate berths. •	Abundant stowage and hanging lockers. •	U-shaped settee to starboard surrounding fixed table with seating for eight or more. •	Bookshelves and storage lockers outboard on both sides. •	Drinks locker to stow bottles and wide selection of wine and spirit glasses. •	Settee on port side, long enough to be used as a berth. •	Work surfaces in Corian. •	Full sized chart table with stowage for charts. •	Oilskin hanging locker aft of navigation seat. •	Access via removable panels and lifting companionway steps. •	Compartment is well lighted and grants good access to machinery. 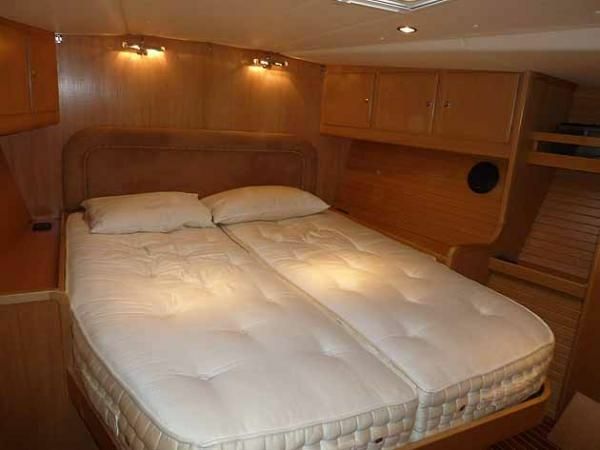 Boatmatch Tip: Have a question about the accommodation of the VR Yachts Vallicelli 65? Contact the seller via clicking on the registering interest button above. When we decided to get a bigger yacht, after owning a Sigma 41 for 15 years, we started looking at 52 to 55 footers. Through Berthon we saw SIESTA, a VR 65, and the rest is history. It was my wife, especially, who was very enthusiastic when she could see the increased space, both above and below deck. She also has mobility problems, so the absence of a bridge deck and level cabin sole with no steps up and down, were great plus points. 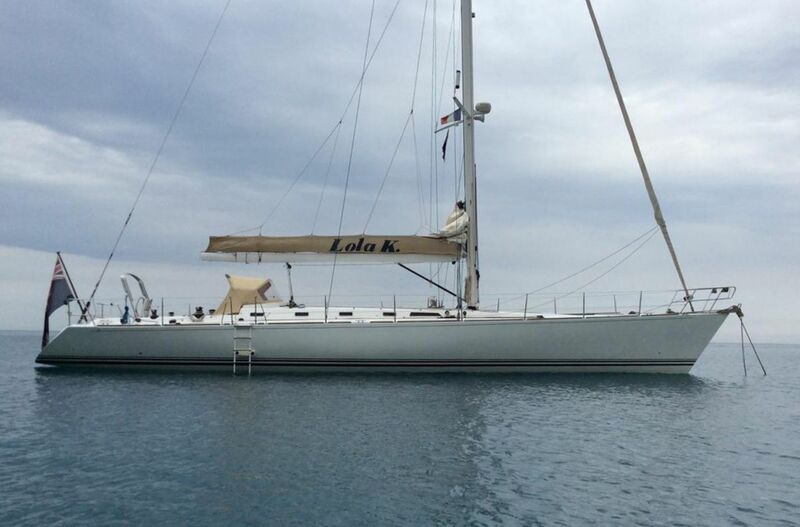 LOLA K is a light, easily handled yacht who might suit potential buyers with slightly less than extravagant ambitions. 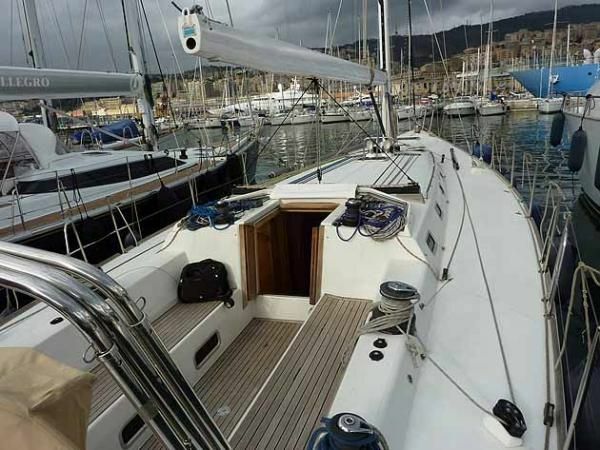 VR Yachts Vallicelli 65 For Sale is lying in Genoa, Italy. At 19.8 metres (approx. 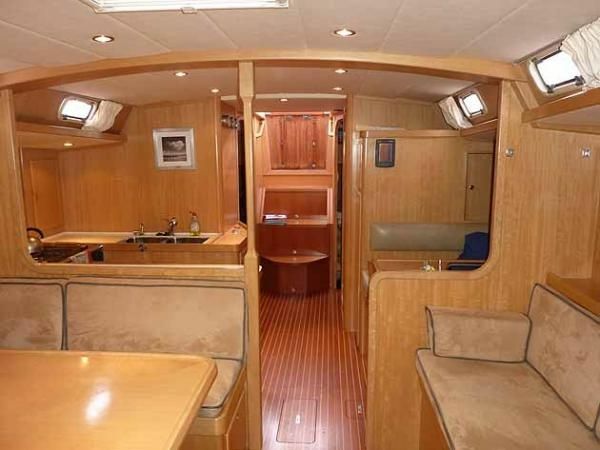 64.96 feet) this VR Yachts is a bargain at €349,000.